Did you ever wonder how an author takes an idea and develops it into a story? Me too, and I’m fascinated by the different approaches authors take. You have your pansters who write by the seat of their pants, the plotters, and those who combine the two. There is no right or wrong way to pen a novel, but I’m happy to say I’m a plotter who embraces epiphany when it strikes. This method works for me for two reasons. One, I don’t write full-time. If I want to write, edit, and polish four or more 100K books a year and still have time for my family, I need to be organized and focused when its “writing time”. I just don’t have time to deal with plot holes or the dreaded writer’s block. And two, I can’t jump from project to project. I get too caught up in one world to be able to switch back and forth. Each series—Wild Hunt, Royal Pride, Kagan Wolves, and Sander’s Valley—has its own set of rules and a unique “feel” that I lose by jumping around. If I do, everything takes on the same tone and characters start to merge. Other authors thrive by doing this. Not me. I can’t do it. After my idea sparks, I let it play out in my head, working the kinks out of it and fitting it into the series arc. This can take days or weeks, and this usually happens while I’m editing another book. When I reach the professional editing stage, my current story is usually solid and only needs to be tightened and proofed. Plotting often involves working on profile sheets for characters, looking for inspirational pictures for scenes to give me a visual nudge, and sketching out the book, chapter by chapter. I even go so far as to write a loose synopsis before I type a single paragraph of the book. Once all that’s done, it’s time to write. Since I work full-time, the bulk of that is done on the weekend, and I use my lunchbreaks during the week to read over what I wrote and do a first pass edit. Then it’s off to one of my wonderful editors. The culmination is release day, and I celebrated one yesterday! 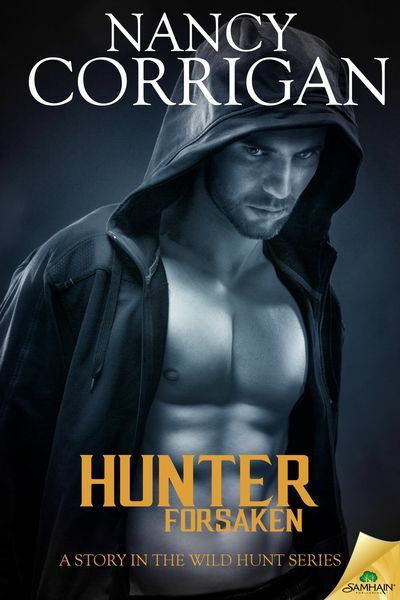 Hunter Forsaken is the newest installment in the Wild Hunt series. Check it out below and if you haven’t read the free prequel, Hunter Sacrificed, you should. It’s available everywhere. Not just any lesser god either. She’d been fathered by the black-skinned, winged creature he’d seen when he joined the Hunt. Arawn’s image had appeared inside his head, much like Tegan’s had over the years they’d visited each other. The sight of him hadn’t bothered Ian. Knowing his dream lover carried Arawn’s genes did. “You knew me before I joined the Hunt, didn’t you?” He had to be sure she’d participated in his dreams, that it wasn’t only his imagination.